When it comes time for the Class D girls race in the Nebraska State Cross Country Championships, it’s becoming an annual custom to see Lindsay Holy Family junior Andrea Weeder accepting gold on the medal stand. 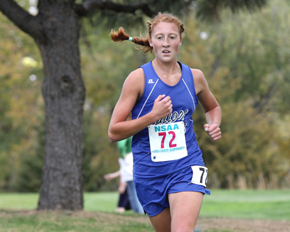 She again led a strong Holy Family/Newman Grove girls team to the 2010 state meet and captured her third consecutive class championship Friday at the Kearney Country Club. Weeder pulled away from the rest of the Class D field during the first half of the 4,000 meter race and, basically challenging herself, pushed on to a time of 15:10 – her best over the state course by eight seconds and nine seconds in front of runner-up Marissa DeWispelare of Aquinas. While winning one championship, much less three in a row, is a daunting task, Weeder has dominated her competition. “It’s a lot of pressure, but my dad (Coach Rich Weeder) told me I pretty much run against the best competition in the state already,” she said following this latest triumph. “That kind of let me know I’ve beat them before. I just have to put forth my best effort to beat them again.